Since the birth of the Instagram-worthy 'Avocado On Toast' craze that transformed everyone's breakfasts and brunches, there's been a lot of renewed interest into the health and skincare benefits of the humble avocado. Needless to say, the skincare world was way ahead of the trend as many brands, especially organic/natural beauty ones, were already using ingredients like Avocado Oil in their products. 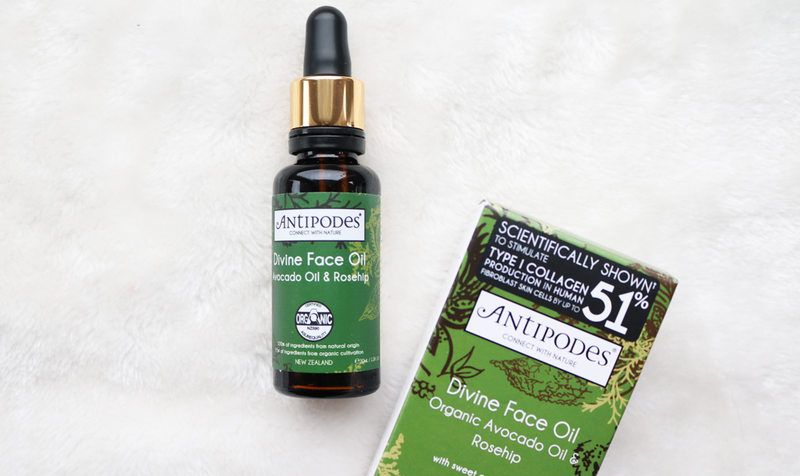 One such brand to use this hero ingredient are Antipodes who use Organic Avocado Oil in a number of their skincare products. 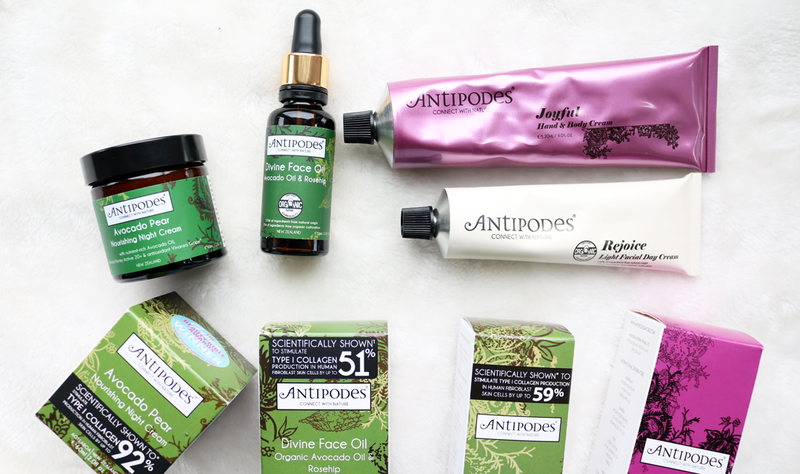 I'm a big fan of Antipodes as regular readers will know, so I jumped at the chance to adapt some of my skincare routine to include these four products which are rich in Avocado Oil to see whether I would see a difference in my skin. I've been testing them out for around 4 weeks now, so here are my thoughts. I've been through a couple of tubes of this moisturiser in the past and it's definitely something that I can see myself going back to again and again in the future. Whenever I return to it, I always think - "Why did I stop using this?! ", so it's been a pleasure to be reunited with it. The Rejoice Light Facial Day Cream is suitable for normal, combination and oily skin types and it's very different from most moisturisers aimed at these categories, simply because it's very hydrating and doesn't leave the skin matte or stripped of its natural oils. Instead, it uses a whole host of organic ingredients such as Manuka Flower Oil, Avocado Oil, Macadamia Oil and Jojoba Oil, to regenerate, moisturise and balance the skin, resulting in softer, smoother skin. I've also noticed that my skin has become less oily over time - the longer I've used it, the more balanced I've seen it become. With this moisturiser, a little goes a long way and you'll likely need to use a lot less than you initially think because it's so hydrating. The packaging is a bit unconventional as it comes in a recycled tube (watch out the very first time you open it as a lot of the product wants to come out! ), but I've soon gotten used to it! 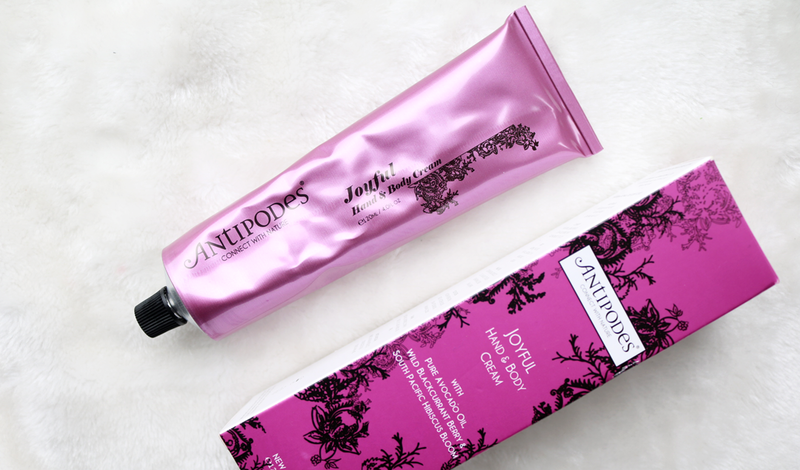 If you only try one product from Antipodes, go for this one! It's amazing and surprisingly very affordable compared to similar products from other brands that I've used. Their Divine Face Oil is something that I would recommend to anyone who's new to the world of face oils as it's light, not greasy and absorbs easily. I know some people are put off by the thought of a heavy oil, so this one offers a much nicer sensory introduction! Packed full of skin nourishing ingredients like Rosehip Oil, Macadamia Oil, Jojoba Oil, and our hero Avocado Oil, the Divine Face Oil is a real treat for the skin as it offers deep hydration and also helps to balance it out. The biggest difference that I see when I use this, is that my skin looks a lot more glowy in the morning (I always tend to use face oils at night but you can, of course, use it in the day if you like as it works well underneath makeup), so it's ideal for anyone who wants a brightening pick-me-up for dull skin. This night cream is a firm favourite amongst skincare gurus and bloggers alike, so I was really excited to finally try it for myself. 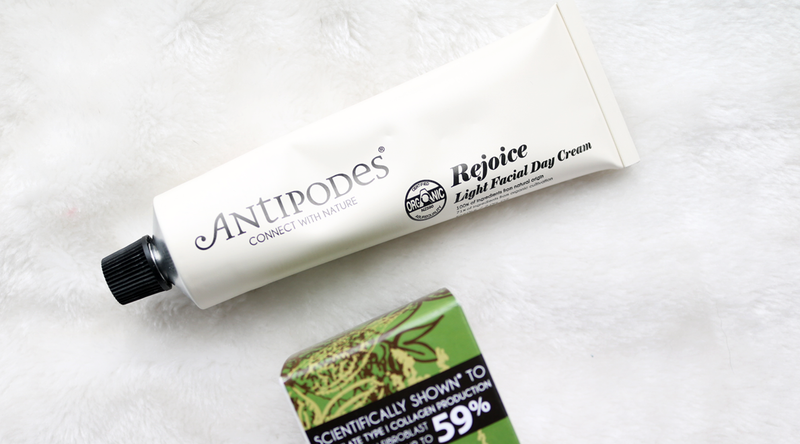 It's won a Green Beauty Bible Award, and like many of Antipodes' products, has been scientifically shown to stimulate Type 1 Collagen Production in Humans (this particular night cream boasts up to 92% stimulation! ), providing the proof that natural based skincare can be just as effective as mainstream equivalents when a brand knows what they're doing with formulas and skincare technology. 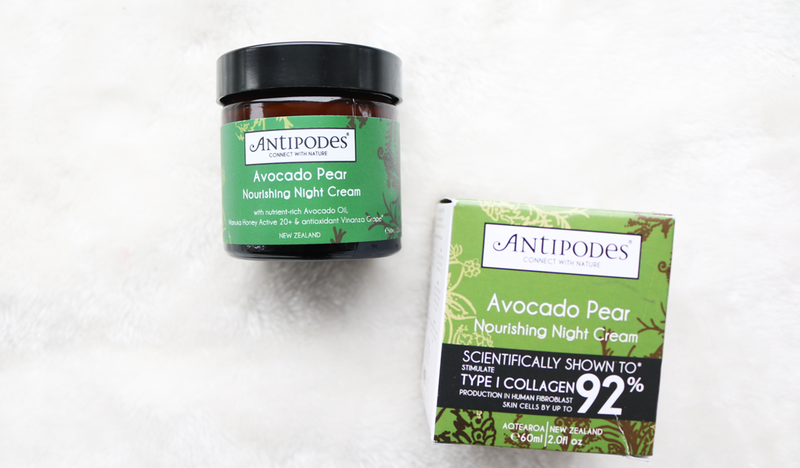 I've been enjoying using the Avocado Pear Nourishing Night Cream, especially throughout February when it was really cold as I felt like it protected my skin against the elements and also helped to keep it thoroughly hydrated. I have a feeling though that this may be too rich for me to use during the summer months, and I can imagine this suiting drier and more mature skin types a lot more than oily/combination ones due to the high content of ingredients such as Shea Butter, Squalene, Avocado Oil and Coconut Oil. That said, I can use it sparingly and so far my skin has been thanking me for it! Joyful is a Hand & Body Cream that's truly fit for a Queen. It has one of the most luxurious scents that I've ever had the pleasure of experiencing (think fresh juicy berries and floral Hibiscus - mmm! ), and the velvety texture of the cream is just incredible. It's made from a 98% naturally derived formulation which makes the most out of two ultra-hydrating ingredients; Avocado Oil and Macadamia Oil, leaving hands and body feeling as soft as a newborn baby. This is definitely something that I reserve for 'pampering treats' and special occasions, and it's a lovely product to reach for if you've had a crappy day and need some cheering up. The colour of the packaging alone just makes me feel instantly happier whenever I see it and the fragrance is simply heavenly. A real luxury treat to use! I loved the Divine face oil when I had it! The Avocado Pear night cream is next on my list, I have combo skin but love richer moisturisers at night! I keep meaning to try something from Antipodes, I just haven't got round to it yet. The pear night cream sounds good though, thank you for the heads up!